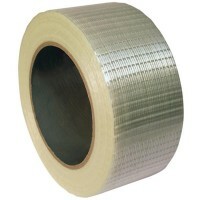 Strapping- Campbell International Specialist Tapes. We know our stuff when it comes to strapping. Having supplied and used strapping ourselves in our warehouse facilities for over 50 years we are experts when it comes to strapping. Whether you just require a single hand operated strapping solution, or a machine based production line, we can consult and supply the latest in strapping technology. Simply Contact one of our strapping consultants on +44(0)1732 773364. For 12mm Polypropylene StrapUses 12mm Semi Open Seals .. Single Lever Windlass MechanismSuitable for very high tension strappingTensions, seals and cuts extruded polyester and polypropylene strappingUses 12mm Serrated Seals ..
Technical specification: 1000 per box.Colour: White.Also available in Black and heavy duty variants. .. 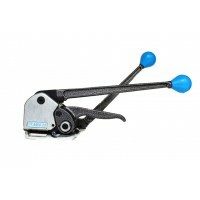 Contents: 12mm x 1500m Polyester Strap500 12mm Metal SealsStatic Dispenser12mm Tensioner12mm Sealer .. Size: 12mm x 30mm x 0.8mmTechnical specification: Seal width 12mmSeal length 30mmSeal gauge 0.8mm1,000 per cartonCarton weight 6.4kg .. Size: 12mm x 25mm x 0.5mmTechnical specification: 2000 per box ..
For 12mm Polypropylene StrapSingle notch action releases highly tensioned strap more easily .. Size: 12mm x 30mQuantity: 100pcsTechnical specification: Strap thickness: 0.726mmGrade 201 stainless steelRibbon wound.High resistance to corrosion.Enhanced weather resistance.Suitable for use in food processing, marine and medical installation. .. Size: 12mm x 2500mTechnical specification: Colour: White145kg break strainStrap thickness 0.55mmStrap width 12mmStrap length 2500mtr280 x 190mm corePacked 2 coils per caseCase weight 23.8kg .. Size: 12mm x 1000mTechnical specification: Strap thickness: 0.8mmBreaking Strain: 260KgPlastic Core. .. Size: 12mm x 30mTechnical specification: Strap thickness: 0.726mmGrade 201 stainless steelRibbon wound.High resistance to corrosion.Enhanced weather resistance.Suitable for use in food processing, marine and medical installation. .. 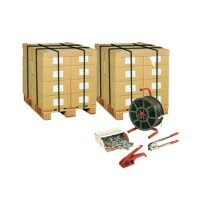 Contents: 13mm x 1100m Polyester Strap1000 Metal BucklesMobile DispenserTensioner ..